Our children Esme and Cormac are now at age where they're up for more than simply hanging out poolside (although we certainly managed to tick that box at beautiful retreat Le Jardin des Douars where the heated pools are set in botanical gardens). We wanted a destination where we would all experience a distinctly different culture. And yet one which is accessible – Morocco is only three hours flight from the UK. If the idea of Marrakesh seems overwhelming, Essaouira, a pretty port town with honey-hued ramparts on the Atlantic is a more relaxed introduction to Morocco. A popular destination with surfers due to its strong trade winds, Essaouira boosts a UNESCO-listed 18th century medina, a maze of pretty white-washed buildings and fabulous beaches nearby. Our vegetarian daughter really enjoyed sampling the different spices and sauces in the tagines, and developed a real taste for mint tea. While staying at multi-tiled design marvel Salut Maroc, which is centrally positioned in Essaouira, we walked the walls, explored the fort, and were enchanted by the bustling fish markets, which the kids liked so much we went back twice. Moroccans love children and were very welcoming, going out of their way to help us have a great holiday. We found our kids were inspired by how open and friendly the locals were, and being a little older had the confidence to engage with people. Our son is mad on football so that was an instant connection. At family-friendly and immaculately run Rebali Riads, just outside Essaouira, we had a walk through the countryside to lunch with a Berber woman who introduced us to her goats and lambs, which the children loved. 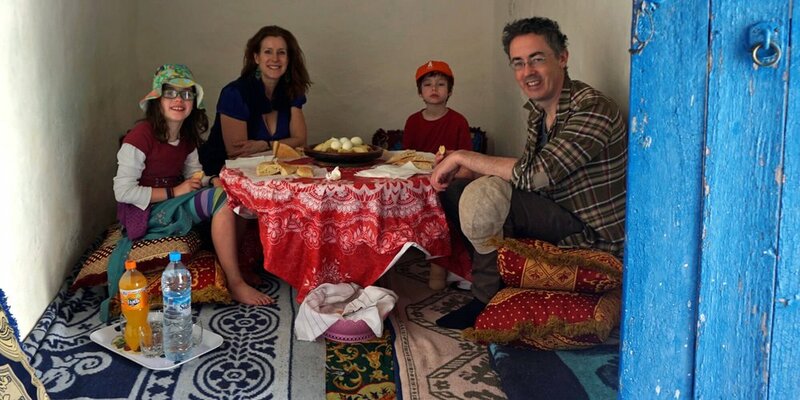 For families wanting to see the sun outside the summer holiday months, Morocco is the charm. For example, day time highs for Marrakech are 19-20ºC on average December-February, and this rises to mid-high-20s for Easter and May and October, and across the winter you can expect eight hours of sunshine a day. We went over February half-term and it was clear and bright with temperatures just over 20ºC, and we didn’t experience the famous winds either, which are at their strongest in the summer months. We could sightsee and explore and head to the beach without baking temperatures. Most tweens and teens enjoy a bit of retail therapy. We loved wandering the back streets and souks of Essaouira and looking at the colours, the myriad of goods for sale, the eateries and normal family life all around us. Our son was delighted to barter for a football strip in Essaouira, our daughter bought a girl’s tunic, both were worn a lot for the remainder of the trip. Seeing artisans at work is always fascinating, and we liked the aroma and taste of the spices so much we came back with a delicious blend which we are still enlivening our cooking to date. Make sure you leave room in your case for purchases; there’s great leather work, slippers, jewellery, pottery, argan oil products and of course, rugs. 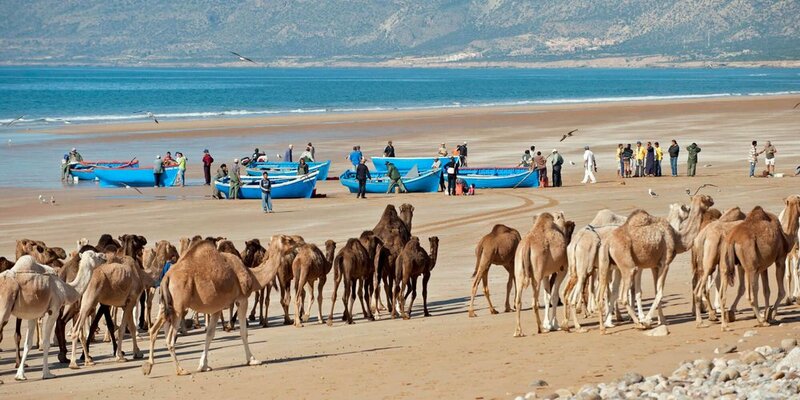 Morocco gives you several compelling landscapes and settings within easy reach of each other. Marrakech is all vibrant hustle and intricate streets, horse and cart rides, culture, shopping and crafts. Yet only a couple of hours drive away and you could be in the stunning Atlas mountains taking tea in Berber villages and hiking vertiginous slopes for amazing panoramas. Half a day south of the Atlas you come to the desert with kasbah-fortified towns and palm-fringed oases. The coast has some of the best beaches and surfing in the world. These can take many forms, a new country and culture brings so many never-to-be-forgotten moments. For us highlights included meeting chameleons and riding camels for the first time at Rebali Riads, trying out a Moroccan spa ritual and a family surf lesson on the biggest breakers we’ve ever seen at surf and spa resort Paradis Plage, where we all stayed up late chatting around the fire pit on our last night. Each of us had a ‘moment’: mine was yoga at sunrise in the shala overlooking the Atlantic at Paradis Plage. For my husband, seeing a three-planet conjunction before sunrise from our flat roof at Rebali Riads. For my son, swimming the full-length of the pool at Le Jardin des Douars; for my daughter, being the best out of all of us when it came to surfing the breakers. Staying at: Le Jardin Des Douars, Essaourira, Salut Maroc, Essouira and Atlantic Coast, Rebali Riads, Sidi Kaouki and Paradis Plage Resort, Tahghazout. When to go: Essaouira is a year-round destination, although March to May or September to November offer the best overall conditions. For more information: www.i-escape.com/morocco or www.i-escape.com/kids or call 0117 946 7072.